kurimanzutto is pleased to present Gabriel Orozco‘s most recent solo exhibition, which proposes a game where logos and the rules of the market are set against each other, as two forms of understanding an ever-growing capitalist world in the midst of collapse: the art market and the market of household appliances in a supermarket within an art gallery. In a full-scale association of functional operations, kurimanzutto gallery opens an OXXO, the most widespread convenience store in Mexico, which will operate as such for the duration of thirty-working days within the gallery in the San Miguel Chapultepec neighborhood. More and more people have access to the imagery of the artists, but fewer of them can consume or collect. Would it be possible that a mass-consumption store such as OXXO sold art on its shelves? Would it be feasible that a gallery became a convenience store for the masses? Have we reached the time of the artist as transnational brand for mass-consumption? To ask questions about supermarkets in the context of a gallery environment opens onto some larger questions not about what art can represent, but how it expands into daily life and what this can reveal. Since the early 1990s, Orozco has been applying circles in many different configurations to a wide array of found and made surfaces: photographs, tickets, money, paper, canvas, bone, terracotta and stone, among others. The spread of circles across multiple differentiated surfaces in his practice could be likened to the way brands and logos work as signs of global capital. By fastening to the surfaces of such a diverse range of objects, including banknotes, but now soft drink cans, candy packets, ice cream wrappers and medicine boxes, Orozco suggests the movements of globalized flows that colonize everything, everywhere. 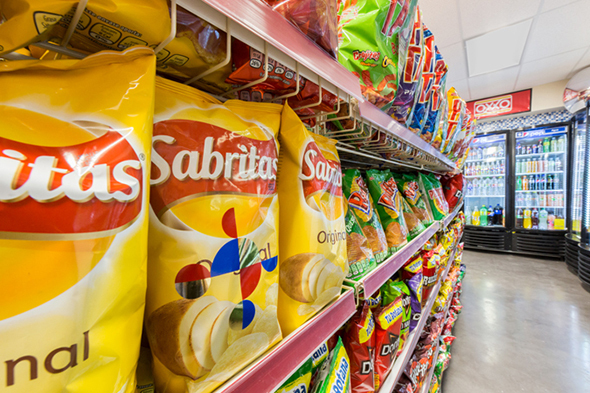 Among the more than 3000 products available at an OXXO 300 of them will be intervened by the artist, ranging from soda and beer to chips, canned food, candy, juice, liquor bottles candles and condoms. These will feature a contraposition of logos and narratives, the juxtaposition of easily recognizable images that suggest an iconic reading of the symbolic Mexican contemporary market. The 300 products selected will be on sale as individual series of 10 pieces each, exponentially reducing the price by each unit, for a maximum total of three thousand works that will be produced only once they are acquired by the consumer and collector.